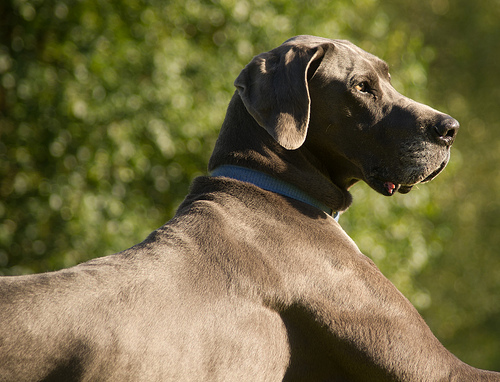 Great Danes are susceptible to Bloat. Lately, I’ve been reading a lot of articles about bloat prevention. Were you aware that there is actually a surgical procedure for bloat prevention in dogs? It’s called a “gastropexy”. But first, let’s make sure you’re aware of what bloat is. Bloat or Gastric Dilatation/Volvulus (GDV), is a life-threatening condition with a very quick onset. It’s considered a medical emergency. During an episode of bloat, a dog’ stomach distends with gas and fluid during dilatation. During volvulus, the stomach rotates on itself. The junction at the stomach and esophagus is pinched off as well as the pylorus. This makes it impossible for the gas and fluid in the stomach to escape from either end. All the contents of the stomach begin to ferment and build up pressure. Also, since the stomach is twisted at both ends this cuts off blood circulation causing necrosis. Which Breeds Are Most at Risk for Bloat? So, now on to the gastropexy. What is a gastropexy? Gastropexy is a surgical procedure in which the stomach is permanently sutured to the abdominal wall. In dogs, the stomach can be sutured to the right side of the abdomen to prevent bloat. This doesn’t mean that you should rush out and have this surgery performed on your dog. So when do veterinarians perform this type of surgery on dogs? Well, there are a few reasons why a vet might do a gastropexy for bloat prevention in dogs. 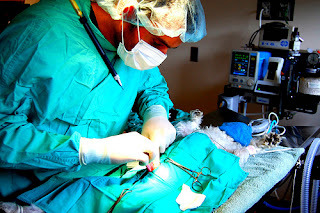 · Gastropexy during spay or neuter. Some vets will perform a gastropexy in high risk breeds at the time of their spay or neuter. For a female, this isn’t much extra work because the abdomen is already open for the spay surgery. Males will have to go “under the knife” a little bit more, though. It’s an easy way to ensure bloat prevention in dogs and you shouldn’t have to worry about GDV for the rest of your dog’s life. · Gastropexy during bloat treatment. This surgery is becoming more popular when dogs are first spayed and neutered. Unfortunately, not all dogs have this procedure performed when they are young and may experience an episode (or more) later on in life. If a dog has to have surgical intervention during a bloat episode, it’s likely that the veterinarian will also perform a gastropexy at this time. I’m sure it would be possible to have a gastropexy performed in a dog just to be on the safe side. Especially if the dog were a very high risk breed like a Great Dane. So what do you think about the idea of surgical bloat prevention in dogs? Have you ever heard of this procedure before? Would you get a gastropexy for your dog? Note: This post was previously published on my WP blog, some of you may have already read it. Yikes lucky we are not on the list. Mind you , you'd have to be fed to get bloat and I am always starving. Have a terrific Thursday. I've heard about this but luckily never experienced it with me, my daughter's or sister's pups. Scary stuff but no, I guess I say don't fix it if it ain't broke. I am pretty big on not doing any surgery unless there is a for sure need. I honestly haven't seen it much either, and I've seen tons of dogs. I don't think there'd be much need to do it in a chihuahua. A chihuahua. That's not even a dog. Great Dane. That's a real dog. Especially when they are akc registered with blood lines. Chihuahuas. There is no blood line. Sorry. That's like doing surgery on a rat. Well, anonymous a chihuahua is indeed a dog. Purebred dogs aren't the only kinds of dogs out there. Mutts are perfectly good dogs also. And rat surgery is pretty unrelated to this, but I've assisted with several pet rat surgeries before. I have to pet rats myself in fact. Having lost a dog to bloat I can tell you it is the most heart wrenching thing you want to see. We were away camping in the mountains and there wasn't a vet for a two hour radius that could have helped and by then it was too late anyway. Our poor boy just looked to us to comfort him and all we could do was hold him and pet him as he suffered and faded. This was a very healthy 6 yr old Akita. Yikes, that sounds painful and scary! Holy moly... is there any way to prevent bloat? My dog-mom passed away in case of bloat. For my mom this bloat is the nightmare N° 1. We have the question on our list for the vet. The worst thing on bloat is, that most the surgery comes too late and not all vets are able to manage the surgery successful. So for me it makes sense to prevent this horrible bloat-thing, but we will ask the vet, what's the best for me. Thanks for this great post - that's very important to be informed, specially about really dangerous things like bloat. I'd never heard of this surgery. I might consider it at the time of spaying in the future with a really high risk breed. It's good to be aware of possibilities. It's a good thing to have done for high risk breeds when they are already under for other procedures. No worries Mollie. This is a repost from the other blog. It's a good post, so I didn't want to let it go to waste. Your articles are very helpful for me as I've just started living with my pup. Thank you very much Rachel! I am glad you find them helpful :) Look forward to watching him grow - he's adorable! My collie group was recently discussing bloat prevention and this surgery. It is my understanding that bloat is not only a breed specific issue but also very generically predisposed issue. So if people didn't breed dogs who have suffered from bloat then not as many dogs would get bloat. Then no dogs would need what I see as a sort of unnecessary, very invasive surgery. How interesting - thanks for sharing! It does make sense that it's a predisposed issue. It's a shame that there are so many breeders out there who are more interested in making money than providing healthy dogs. The surgery is very invasive, but may be a good option if a dog is already undergoing another procedure, such as a spay. Otherwise, I haven't heard of too many people just going out and getting it done. I guess I missed this post. :) There is so much misinformation about bloat out there. It is not proven that if it is a predisposed issue. Many dogs bloat that do not have any history of it in their lines. Body style is a consideration to the extent that is genetic, but it effects even mixed breed dogs so genetics alone is not the answer. (See the x-ray on my blog today.) I have known mixed breed dogs that have died of bloat as well as pure bred dogs. When I wrote that tacking can fail in young dogs, the ER vet told me that she has treated dogs that have had the procedure done as a young dog (say under 2) and it failed when they were older, say over 8. She cautioned us from having it done early if we were ever in a position to do so. The vet we took Thunder to was quite knowledgeable because she sees 3-4 bloat (GDV) cases a week. I was shocked at the number when she told me. I had no idea it was so high. Well, genetics are actual responsible for body type, and the feature of the deep, narrow chest is determined by genetics and is often seen in cases of bloat. Not exclusively, but that seems to be present in many of the dogs who get this problem. My vet hasn't seen many failures, and most vets recommend doing the procedure when the dog is under for neutering, which is usually done at a young age. Not sure what your ER vet means, but bloat can happen at any age, so what age does the vet recommend for the procedure? It only makes sense to do it when the dog is young. Nothing is guaranteed - nothing is 100%. Yes, the number of bloat cases is very high, probably due to the massive overbreeding of dogs. The extreme body types are one of the suspect culprits, but also probably some other weakness of the internal organs. The horrors of overbreeding, particularly in the U.S., have caused innumerable canine deaths. That can affect mutts, too, because they can inherit the genes that cause problems in purebreds. You may not have been following yet when I published this? Not sure. One vet I worked for did some laparoscopic surgeries, but we fortunately did not see many bloat cases or need to do it to anyone. It's probably expensive because not every vet knows how to do laparoscopic techniques and the equipment needed is expensive. Our vet had to purchase a machine (initially made for humans) in order to be able to do the laparoscopic spays that was VERY expensive... 5 figures or so. I probably wouldn't do the abdominal surgery unless a doctor was in there already for another reason. ER hospitals see a lot of bloat though. It does make sense to me that the surgery would last that amount of time. I think it's a nice amount of time, but I guess that means it's not fool proof. It makes sense what you are saying about the costs to purchase the equipment needed to do the surgeries. Our 9 year old Basset Hound experienced GDV. Fortunately we were home when it happend and rushed him to the ER. He had life-saving surgery-it was one of the scariest, and longest nights of our lives. He would have died a horrible death had we not been able to get him to the hospital in time. He suffered greatly from the time of the GDV until he got into surgery. He has since passed away(boy we miss him). We have a new handsome basset hound and are planning to have gastropexy done when he's old enough to be neutered. We would never want our new little guy, or us, to go through what poor Gus had to...with science advancing and our fantastic vet, we will have peace of mind knowing that Otis will never go through a GDV. Thank you for this article. Thank you for your comment! I'm glad you were able to help your older Basset Hound and are going to be getting the surgery for Otis. May he never experience GDV! I have Akitas, not on your list but my vet has asked me to consider "pexying" my boy. She does do everything laparoscopic though, so its a little less invasive. Not sure what to do. I think it would be fair to include Akitas on the list. There are just so many that it's hard to include everyone! Laparoscopic surgery is wonderful. If he's already being neutered, I think it's a good idea to get it done. If she wants to do it by itself, there's a little more to think about of course. Poodles and Goldendoodles should be added to the list, also, as they are deep chested breeds. I have unfortunately been through bloat/gastric torsion, and lost my Goldendoodle furbaby on July 8, 2013. He was the best dog I've ever owned, and going through it was absolutely HORRIFIC! He went through emergency surgery, but unfortunately after two days of trying to recover he passed. They had to remove a section of his stomach, his spleen, and a small section of small intestine. He went through so much, it was just devastating. I recently opened my heart to a Goldendoodle puppy and when he will be neutered at 6 months of age he will be getting a pexy at the same time to be preventative. I never ever ever want to go through that again!!!! Hi Stephanie, so sorry you had to go through something like that! Those types of surgeries can be hard on some pets. I do have Standard Poodles on the list, but that list is still probably not complete. It could go one forever I am sure! Glad you were able to open up your heart to a new family member and that you are going to take steps to prevent bloat for him as well. Good luck! I have two Great Danes... How old would you reccommend my dogs be before having both the gastropexy and neuter surgery? I lost Elvis, the Greatest Dane, in 2010. He was only 18 months old and I had gotten the gastroplexy done when he was neutered. His stomach didn't "twist", and x-rays, etc looked normal. It wasn't until the opened him up to do exploratory surgery that they found his mesenteric artery had twisted. I don't know what would have happened had I NOT had the surgery done. But I can tell you, I now have a female dane (she's 3!!) and I skipped the preventative gastroplexy. It is a sad truth, but things do happen in surgery. My own dog's spay didn't go as planned. I had her spayed while I was at work. I worked as a vet tech in a clinic so my boss was the one spaying her. We noticed some bleeding from her incision that afternoon and decided to re-open her. One of the ligaments was bleeding below the suture. It was difficult for them to find the problem, but they were able to fix her up thankfully. Out of all the spays and neuters we ever did there and nothing like this ever happened, except for on my own dog. I don't regret spaying her however. Stuff happens =/ So sorry for your loss of Elvis. It's a very sad story. Yeah, my doggie soulmate - a gorgeous red, tan and white mutt, who even appeared in national ad campaigns (and though every person he ever met was his new best friend) - passed away after an easy and standard surgery to remove an intestinal blockage. The surgery was successful, but his immune system mysteriously crashed, causing his organs to shut down. We suspect a side effect of the new allergy drug Apoquel, which he had been on since testing phase. So now with my new pup, I have to decide whether to do the gastropexy procedure tomorrow morning while he's getting neutered. He's another mutt - a Shepherd/Akita/Pit/something mix - and it looks like he may develop that deep, narrow chest. I'm really on the fence about this, but have to make up my mind when I drop my pup, Dash, off in the morning. Hello! I have a Greater Swiss Mountain dog. I did the surgery when I had her fixed. It give me great peace of mind to know I lowered her risk of getting bloat. We have another big dog and they play hard after she eats and she also sleeps on her back with a full tummy. Big hollow chested dogs are at the greatest risk. Preventive maintence done easiest when they are getting fixed. Is expensive tho. My Bernese Mountain dog Blizzard is about to turn 1 and is getting put under for an X ray to get his hip score. I have decided to get the pexy op as advised by my breeder while he is under. I hope everything goes well and that it was a good decision. What is the recovery like afterwards? Young puppies and dogs usually recover from these things very well. He'll probably be fully recovered in 7-10 days, but may act like he's fully recovered by the next day even. Still, don't let him be rambunctious until his doctor says it's OK! On May 1st, 2013, our 14 year old Golden got bloat. I rushed him to the Vet ER and he had the 3 hour surgery to correct it. It was one of the scariest days of our lives that the doctors were impressed that he made it through..... They did tack down his stomach and he recovered nicely considering his age. He did stop eating dog food though after so we had to cook for him and he ended up getting a tumor in his abdominal cavity and died on December 4th, 2013. It was a very stressful time between the two events but I wouldn't have traded it for the world... he didn't suffer and he had a lot of happy days. I'm not sure if the tumor was related to the surgery or not but by the time we found it, it was the size of a volleyball. We did recently get a new puppy (Labradoodle) and the vet who knows us well, suggested we get the preventative surgery so we don't have to go through this turmoil again. It seems though that the people who are opting for this surgery are the people who have experienced this before? Do you think that is the case? I people did not feed their dogs grain-based dog food, there would be fewer instances of bloat, along with fewer other health issues for the dogs. Dogs are not meant to consume a diet consisting primarily of corn or wheat, but look at the ingredients of most available dog kibble today. I followed all of the bloat prevention rules with my Bernese Mountain Dog. However, he got GDV (bloat) in December 2015 and passed away after surgery and a few days in ICU. It was awful. It looks like I might have to spay my girl Berner, and when I do she will also have the Gastroplexy surgery to prevent GDV. I just can't lose another best friend like that.